Youngevity is on the fast track! we have ALL the components in place to create YOUR success! A Business with Youngevity will Nourish Your Body and your Soul. Create a healthy lifestyle that gives you physical health, financial freedom, and time flexibility! Youngevity: Add years to your life .... and life to your years!! Find out more about the Business Opportunity by watching this short video. Please contact me with ANY questions! I'm looking forward to hearing from you! The standard messaging is that you are to get your education, and get a career JOB. Then you'll have financial security. But you have you ever really thought about that?? How secure is your income? At a 'regular job' - when you stop working, you stop getting a pay cheque. How is this different with network marketing? Leveraged income. Residual income. Once you have an established team and clientele, even if you are no longer working your business, you will continue to get a pay cheque! THAT is income security! 1) Lead by people of integrity. Check. The management team of this company is incredible; our CEO Steve Wallach has even been nominated for CEO of the Year 2013 through The Academy of Multilevel Marketing! 2) Lead by people who know how to build a large company. Check. Youngevity is an 18-year old publicly traded company with sales of 100,000,000,000 USD annually. In the past few years there have been a number of company acquisitions that have strengthened the team, and the focus for 2014 is International Expansion. 3) Financial Stability. Check. Annual sales of 100 billion. Ratio of assets: liabilities is 2:1. 4) Strong product. Check. Youngevity has stellar products with a diverse product line. One of our core products, Beyond Tangy Tangerine, was nominated for Product of the Year in 2013 through the Academy of Multilevel Marketing! 5) Has to have a way to make money. Check. Youngevity has an incredible compensation plan, excellent training and support, and products that are life-changing. You can become a Youngevity Distributor for as little as $25. This will allow you to earn bonuses and commissions as you invite others to try the products, and give you extra perks and discounts (ask me about the extra Heritage Makers Publishing discount!). It also gives you an automatic 30% discount on everything that you purchase, while you're shopping from your OWN STORE! You're simply redirecting your household spending, and teaching others to do the same!! Becoming a CEO Qualified Youngevity Distributor gives you an incredible deal on a Family Start Pak (choose from several options) AND qualifies you receive additional Fast Start Bonuses, Car Bonuses, Leadership Coding Bonuses, Global Revenue Sharing, and more!! All by continuing to share the products and fabulous business opportunity with others! A CEO 'business in a box' is your fastest route to success!! Choose your CEO Kit Now! Get Free Products, Supplement Income, or Change Your Life. Well, that's up to you! Share a little and you can get your products for free. Share moderately and you can supplement your existing income. Share a lot and you can change your whole life! Do you dream of having more money for not only peace of mind, but adventure? We can help with that. Not only can you better your finances, you can spread the wealth. Do you dream of more freedom? Spend more time with family and friends and doing the things you love by choosing your own work hours, and arranging your day to fit your needs. Join today and control your own destiny. Improve your life with optimal health and financial freedom. 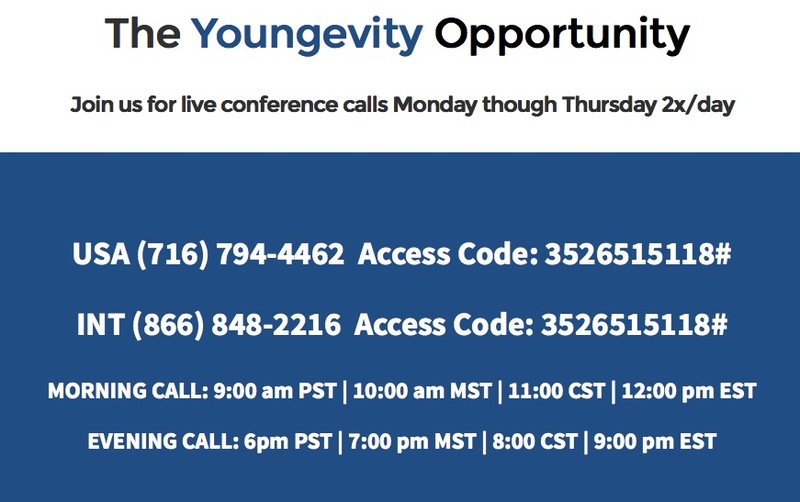 Join Youngevity Today!